Think of a missing tooth as a space where a tooth used to be. Above and beyond aesthetics, that tooth’s purpose included acting as a chewing surface, holding its place with regards to adjacent teeth, maintaining the bone structure where it was rooted along with many other structural and preventative roles. Without that tooth in place surrounding teeth can shift causing gaps and making decay more likely, bone loss and damage can occur, the area can become more apt to periodontal disease and the list goes on. To avoid bone loss, maintain the proper spacing of your teeth and avoid the maladies associated with a missing tooth, an implant may be required. An implant will take the place or more appropriately fill the space that your missing tooth once held. A dental implant is a small prosthetic post that is placed into the bone of the upper or lower jaw. 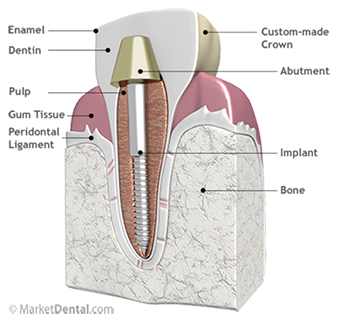 The post functions as the root portion of the lost natural tooth and serve as an anchor for the replacement tooth. Once the post has settled an artificial tooth is attached to fill the space that was once your missing tooth. A dental implant often restores a patient’s confidence in their smile, the ability to eat comfortably and a clean, healthy oral environment. Dental implants look and feel exactly like natural teeth: no one other than you and your dentist will be able to tell the difference. There are many different types of dental implants available. Our Yonge and Eglinton Dentists would be pleased to discuss the benefits of implant prosthetics with you. If you are looking for an experienced dentist in Toronto for dental implants, please give Dayan Dentistry a call at (416) 322-3233 to schedule a consultation with our dentist. Visit our office and you’ll not just be treated, you’ll be pampered.